Link: The Maltese Cross is in reference to the location. The phoenix symbolises the establishment of the station on the site of a ‘shadow’ aerodrome. 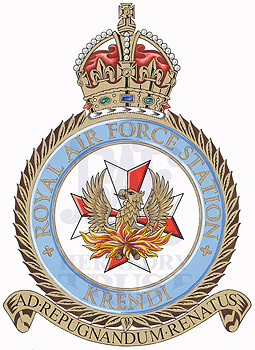 History: RAF Station Krendi opened 10 November 1942; it is not certain when the air station ceased being an active airfield (there is no record at AHB/RAF of a formal closure date). However, operational flying ceased by September 1943 and in December 1945 it became home to HQ No 284 Wing which left on 1 March 1946. After this it appears to have become home to the RAF Malta Meteorological Office until all the British military bases were closed on 31 March 1979.